﻿The air flow meter, mass air flow sensor or maf is located in the engine compartment usually adjacent to the air filter assembly. 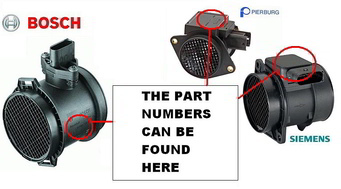 The part numbers that you need are located on the outside of the housing/tube. Pierburg mostly start with 7. If you see PBT-GF30 on the housing/tube then the number you need will be on the opposite side to this.